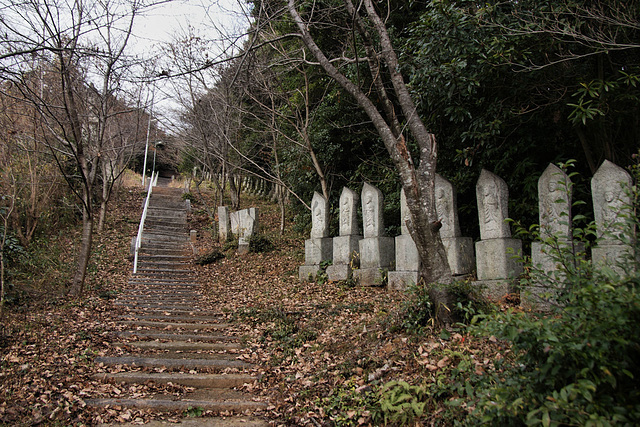 After crossing the rivers on my way to the coast from Yukuhashi I spied this line of statues leading up the hillside. 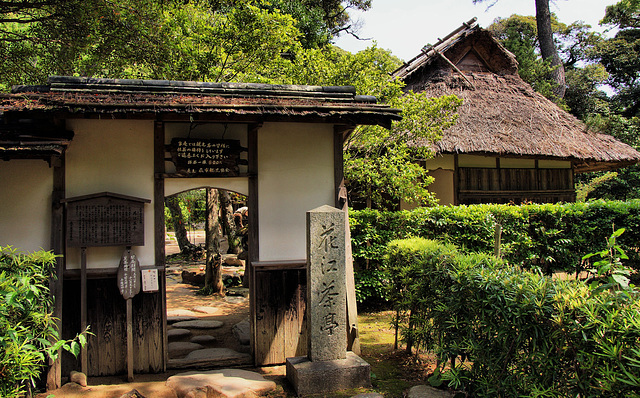 The sign said it was number 61 on the "new" 88 sites Kyushu Pilgrimage. 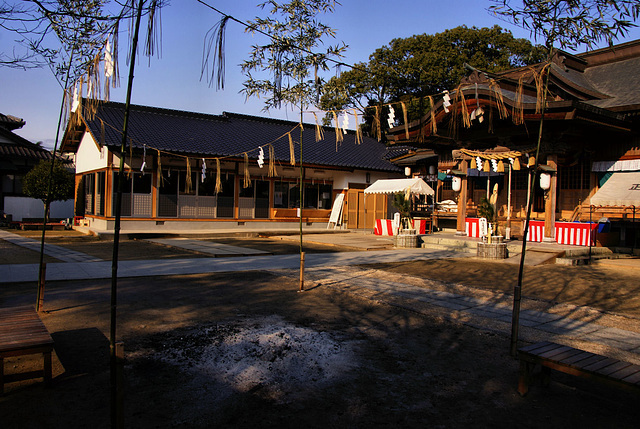 The 88 temple Kyushu Pilgrimage I was walking was founded in 1985, so I guess this one must be much newer. 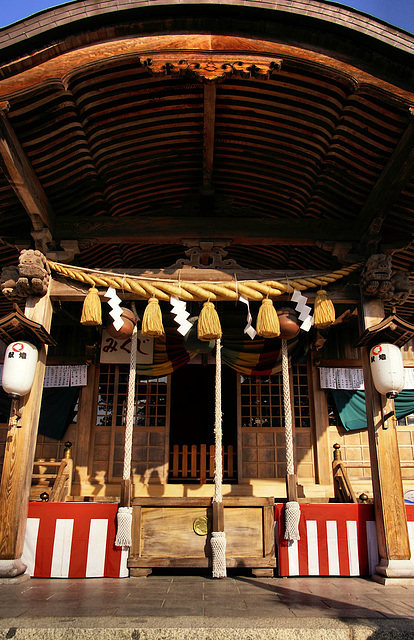 It is not a registered temple of any kind, rather a site used by Yamabushi for ascetic practises. 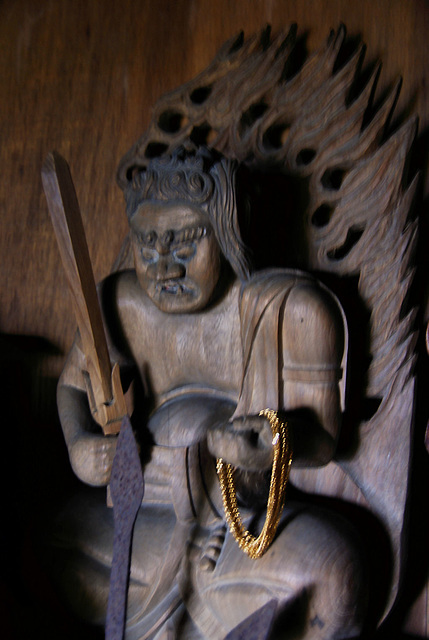 There was one small building with a large altar with this Fudo enshrined. 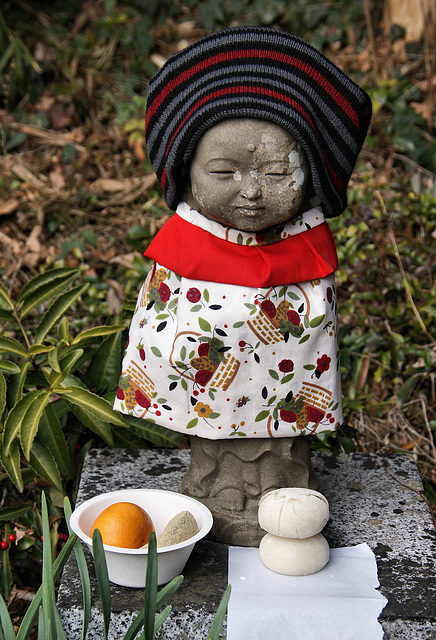 Several other Fudo statues were around the grounds too... both this large stone Fudo and the small Jizo had fresh new year offerings. 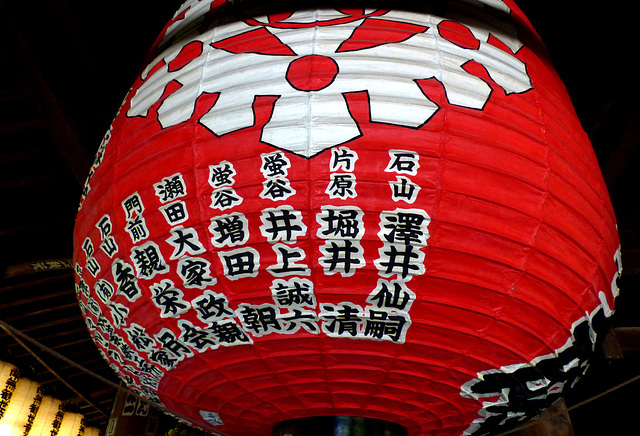 Paper lanterns are ubiquitous in Japan with white or red being the most common colors. 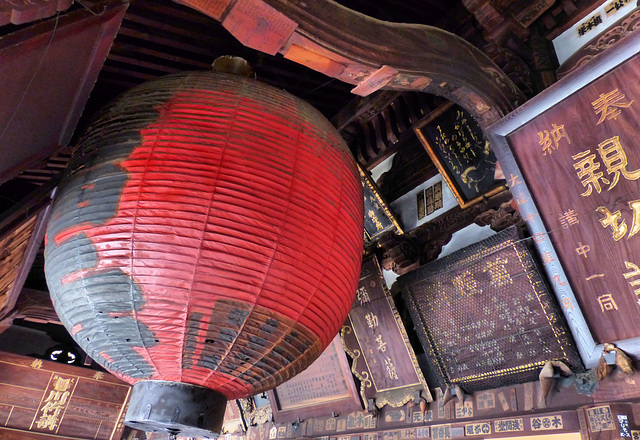 Small red lanterns hanging outside an establishment typically suggests that alcohol is served inside. 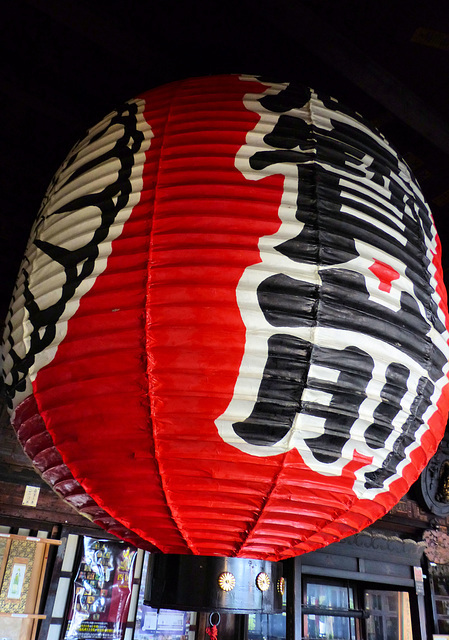 Temples also feature lanterns, with very large, red ones being found at some temples. 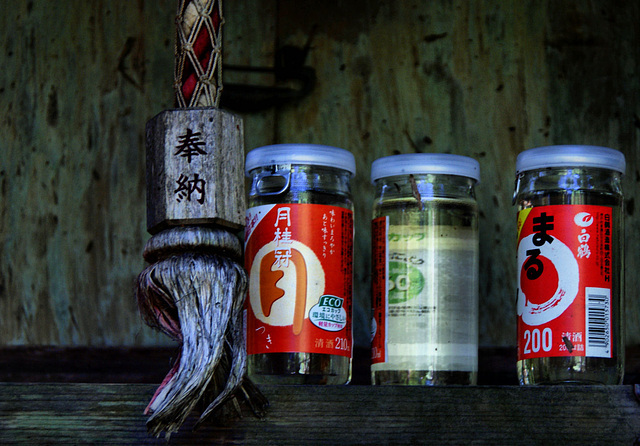 These examples were all found while I was walking the Saigoku Kannon Pilgrimage this year. 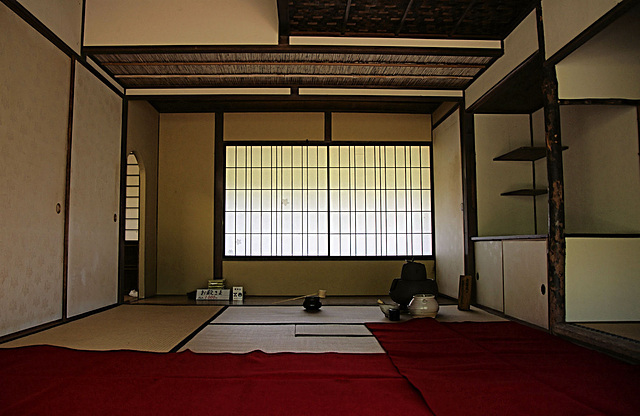 The first photo was taken in the main hall of Kokawadera Temple in Wakayama Prefecture. 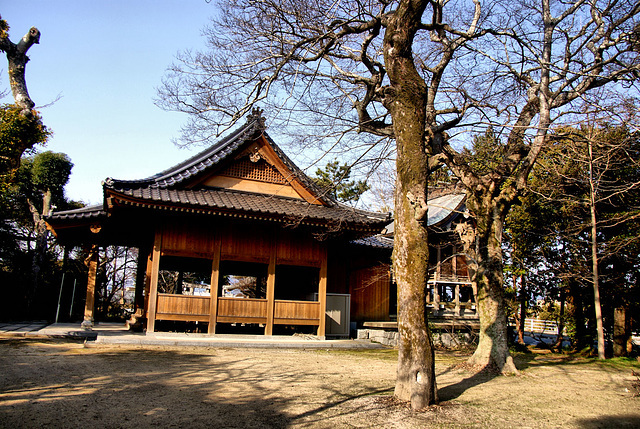 The second is at Sefukuji Temple in the mountain in the south of Osaka Prefecyure, and the third is at Ishiyamadera temple at the southern end of Lake Biwa in Shiga. 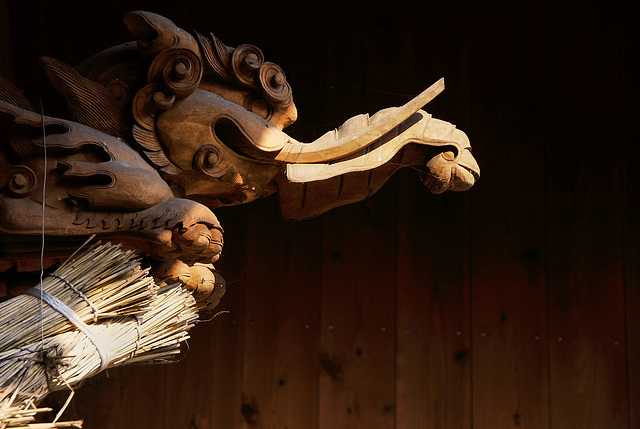 The fourth is also in Shiga, at Miidera Temple, and the final photo is at Imakumano Kannonji Temple in Kyoto. 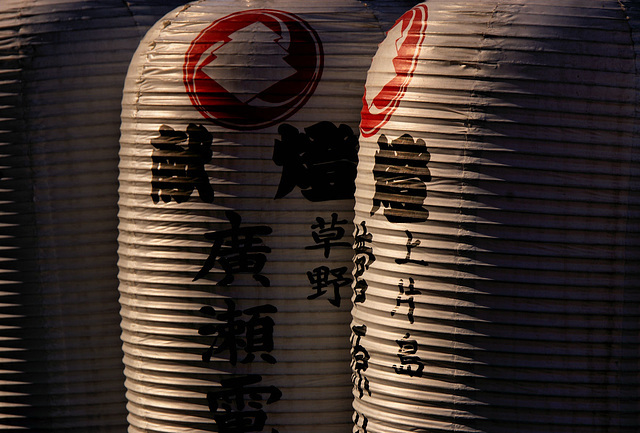 Friday September 23rd, 2011, the tenth day of my walk along the Shikoku Pilgrimage and I was still in Tokushima. 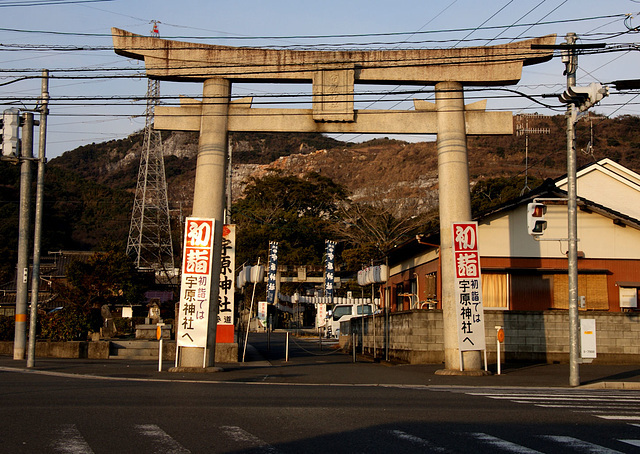 By 8:30 I had finished visiting Yakuoji, temple number 23 of the pilgrimage and I spent the rest of the morning heading down route 55 towards Mugi. 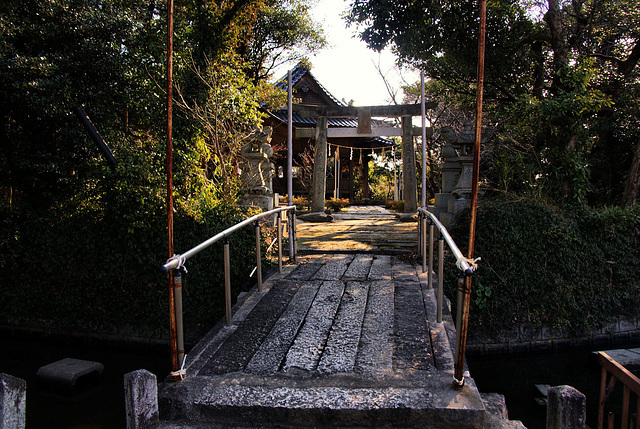 Along the way I passed numerous shrines some small, some a little grander, and I stopped in to check them out. I didn't bother taking notes so I don't know their names nor the kami enshrined therein. 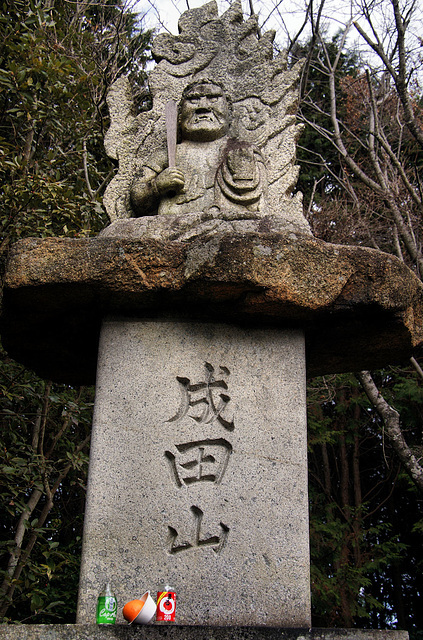 Almost all the pilgrims I encountered on my walk just walked past these shrines, concentrating on reaching the next pilgrimage temple, but I believe in the old days pilgrims would have done what I was doing, and stop in at every sacred site along the route. 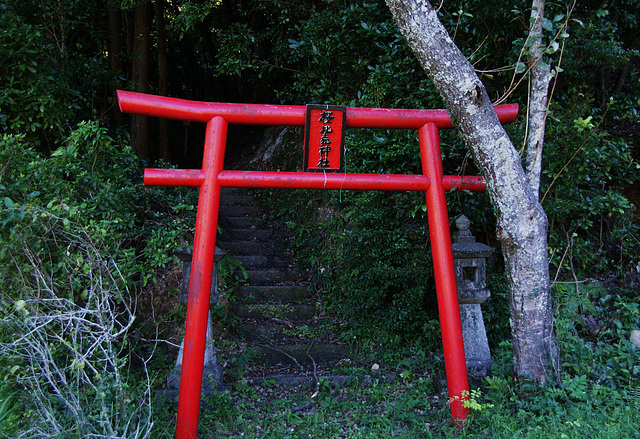 On my way out of Yukuhashi, heading towards the coast, I stopped in at a small local shrine whose entrance beckoned me. 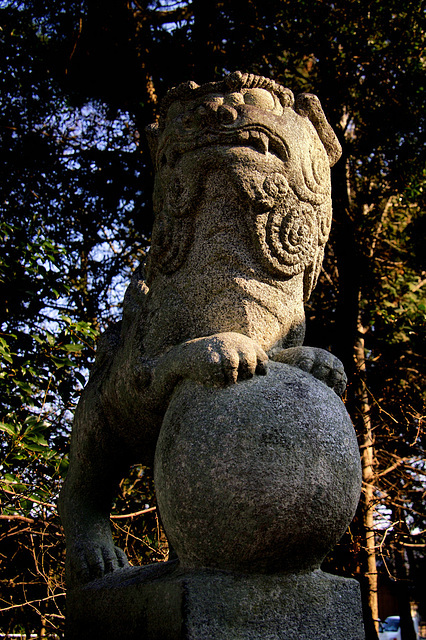 Shrines are great stopping places on walks.... a quiet space away from traffic, and often with something to see in terms of statuary, carvings etc. 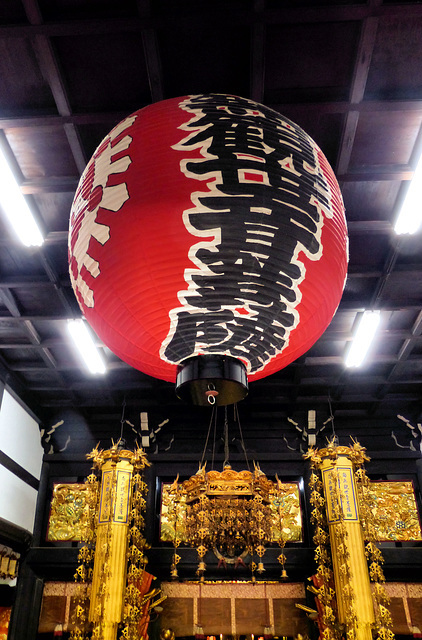 This one is a Kasuga Shrine, a branch of the famous Kasuga Taisha up in Nara, and therefore enshrining the same gods. It has obviously been rebuilt quite recently. 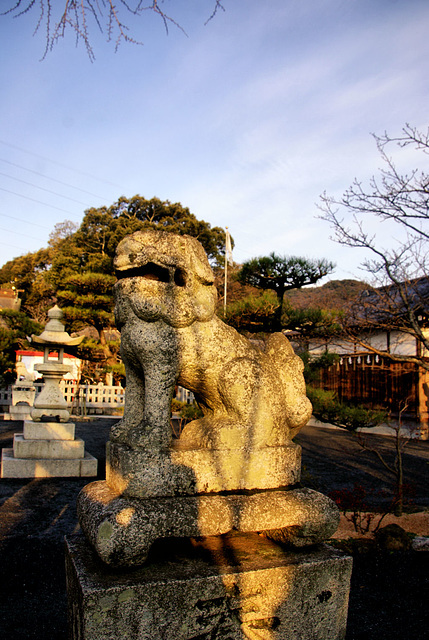 One thing I am always on the lookout for at shrines are the komainu, as their designs are quite varied. This shrine had quite nice elephant carvings. 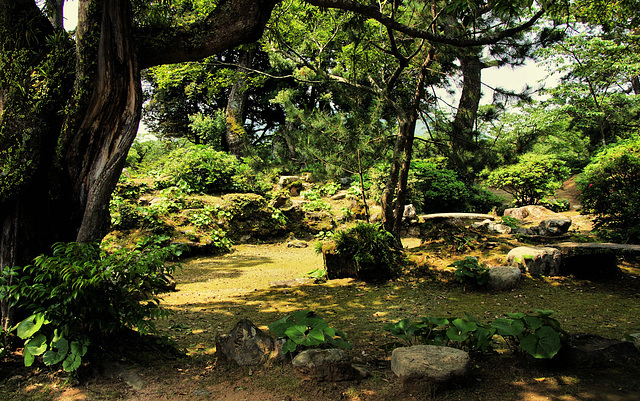 Within the grounds of the Hagi Castle ruins there are not many buildings. 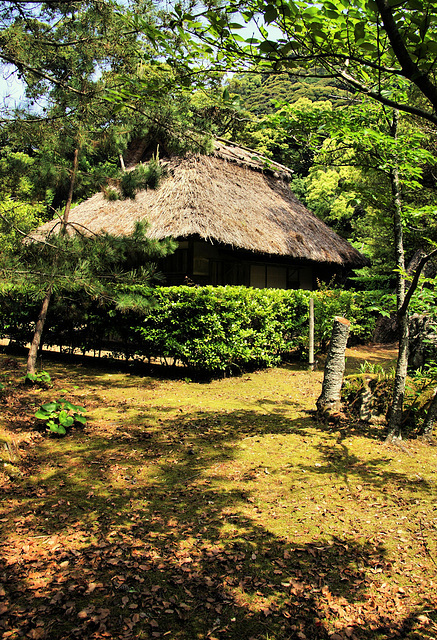 A small storehouse, a fairly modern shrine, but there is also a small traditional teahouse set among some gardens. Of all the times I have been there it has only been open once, but there always seems to be someone working on the gardens. 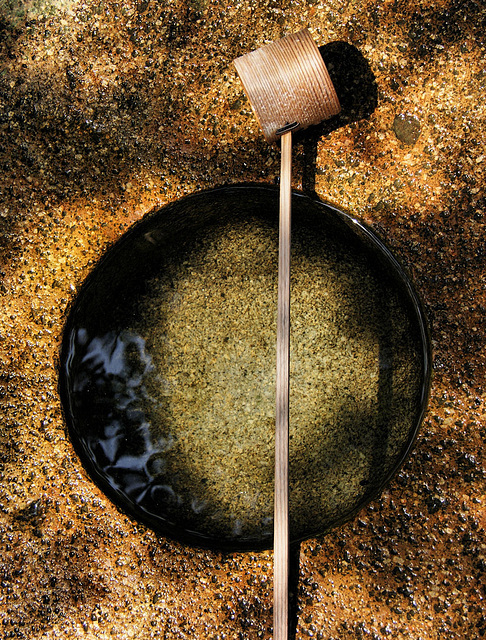 I believe it is possible to have tea here but I can find no information as to when or how much. 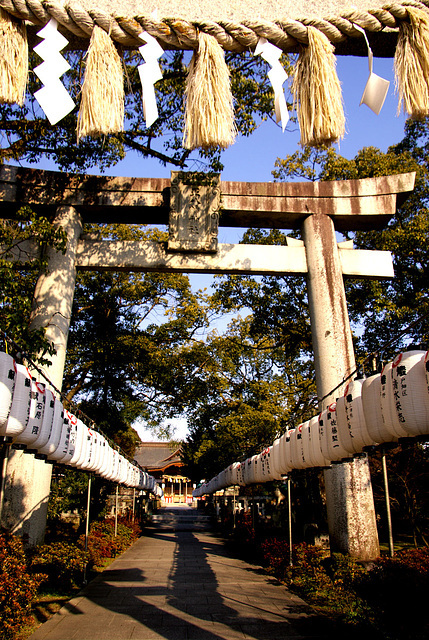 Shohachimangu is a very popular shrine located right in the middle of downtown Yukuhashi. 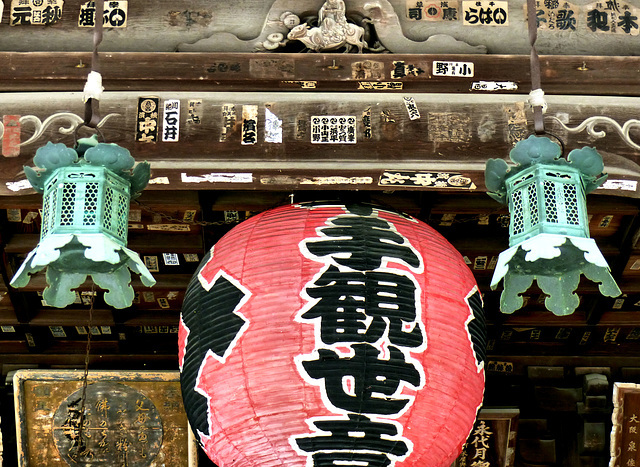 When I visited all the lanterns and banners were still up from the new year, the most popular time at any shrine. 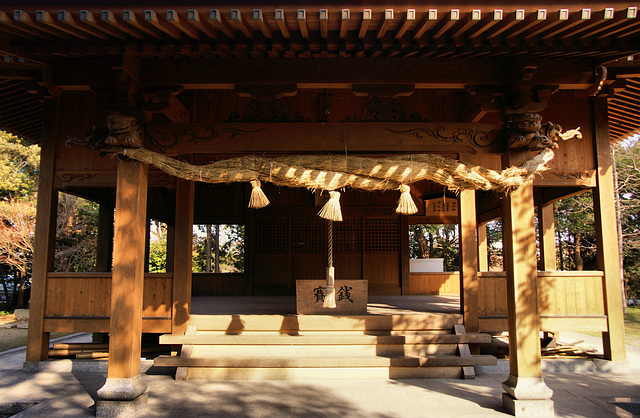 Marked with 4 bamboos connected by shimenawa, this is a temporary sacred space wherein last years ofuda and other lucky charms would have been ritually burned. 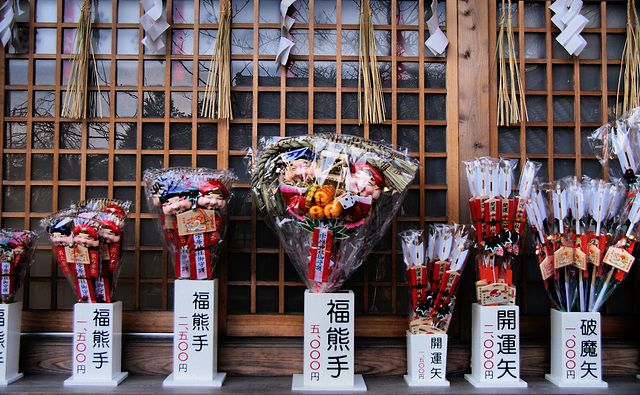 Mos people purchase new ofuda and amulets etc each new year. 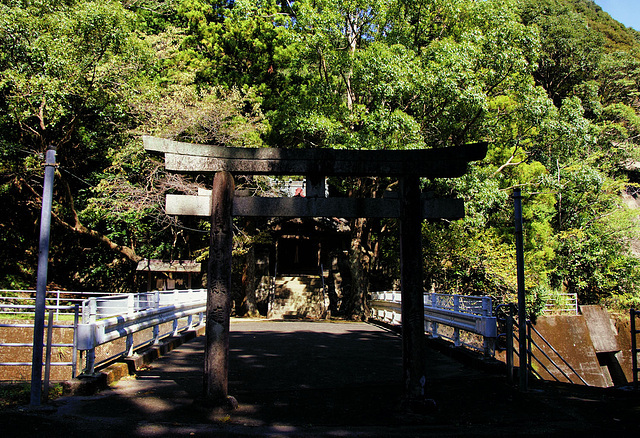 It is not a great distance from here to the original Hachiman shrine at Usa, and before hachiman spread to central Japan it had many shrines across Kyushu. 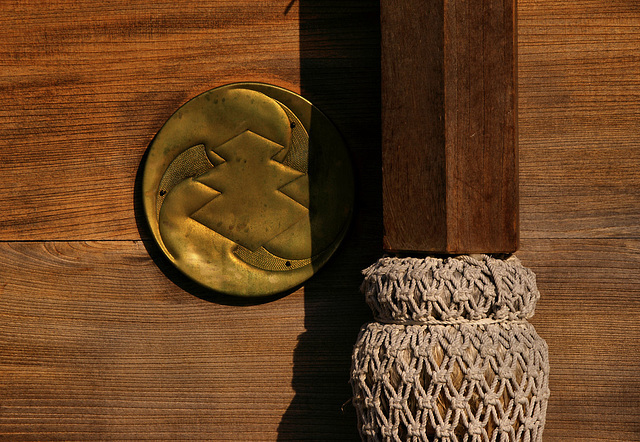 I was unable to find out which kami were enshrined in the various secondary shrines in the grounds. 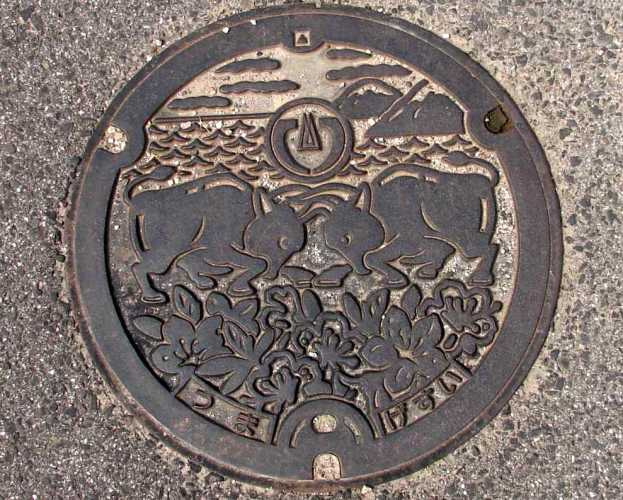 An unusual subject, one would think, for manhole designs in Japan is cows and bulls. 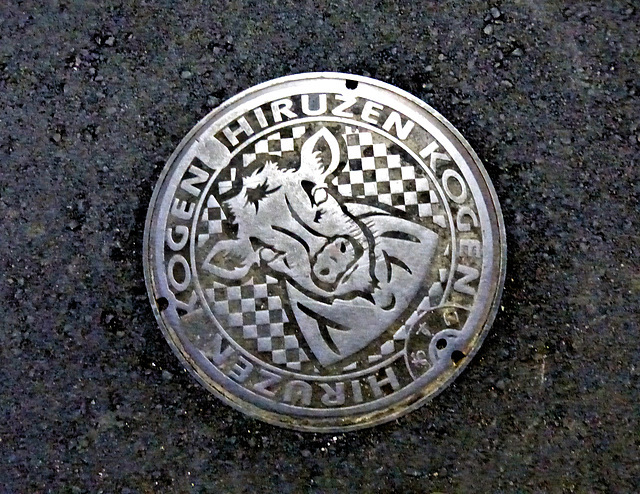 This first one is from the highlands of the Chugoku Mountains in northern Okayama, Hiruzen-Kogen, which is apparently the main breeding area for Jersey cows. Who would have thought it? Chibu, the smallest inhabted island in the Oki Islands group in the Japan Sea off the coast of Shimane, is famous for raising cattle, Unusual for Japan you can bump into them standing in the middle of the roads. 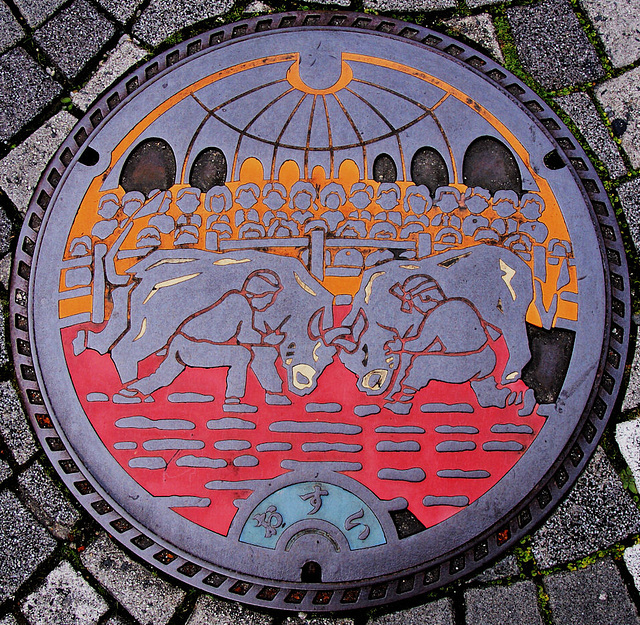 Bullfighting or rather Bull Sumo, is popular in several areas of Japan, including Uwajima on Shikoku. Bull Sumo is also very popular on Dogo, the largest of the aforementioned Oki Islands. 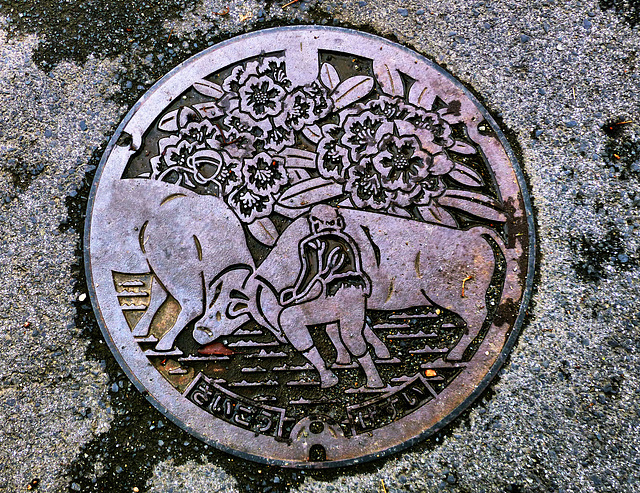 Two of the towns have fighting bulls on their manholes. 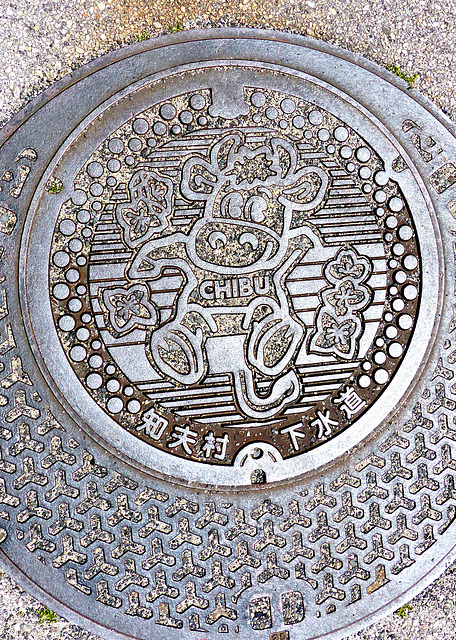 Oharahachiman is located not far from the Obasenishikodai-mae train station in Kanda, near Kokura, Kitakyushu. 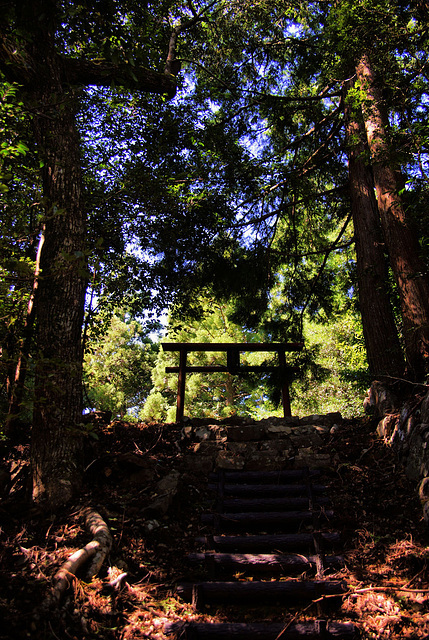 Where this first torii now stands was once the seashore. Now the sea is a couple of k away. 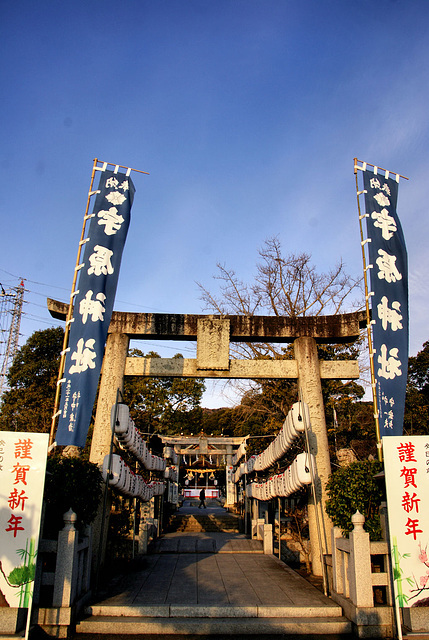 Being early in the new year the banners were up and both the long approach road and the shrine precincts were lined with lanterns. 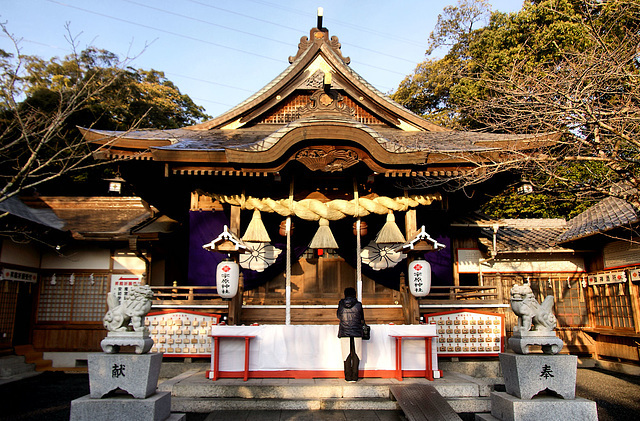 Though named a hachiman shrine, it is not related to all the other hachiman shrines. 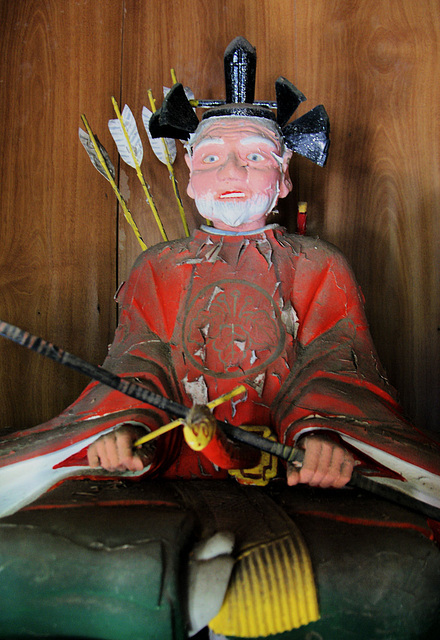 The main kami is not Emperor Ojin, but Oharanosukune. 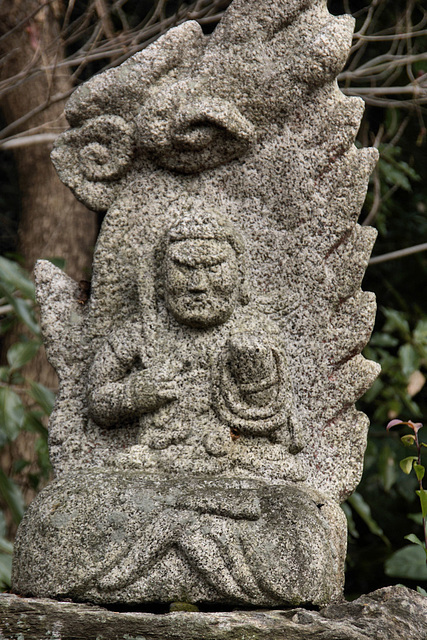 Sukune was a name/title that kind of means "land creator" and he is considered to be an ancient leader in the Fukuoka region.